In the process of packing for our big move, there were a couple of times I noticed CSB going through photos and other nostalgic items, and realized that when I changed my life five(-ish) years ago I purged myself of a lot of memorabilia. Not only were there a lot of memories I didn't mind not holding onto, but I didn't have a lot of space to store the things associated with memories I did want to hold on to. Moving from a four bedroom house into a converted garage shared with a two-year old forces one to make decisions about what is necessary to hold on to, and what is taking up vital space. I spent two years living in my best friend's garage, deciding which things were important and which things were just random scraps of detritus that I would wonder about the origins of in the years to come. I learned a valuable lesson about the difference between things and memories. But, in the packing and moving of "stuff" this time I started to feel a little nostalgic for nostalgia. I wondered what things I had gotten rid of in the past that might conjure a memory or a story now. 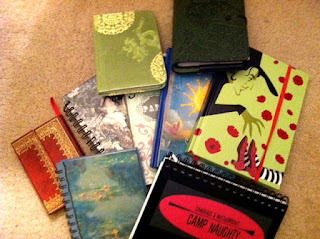 While unpacking in our new home, I came across a stack of notebooks which had been sitting in my nightstand for a good two years until I unceremoniously grabbed them, stuffed them into a box with a bunch of other random junk, and tossed that box into a pile. Today, I found the journals that were in my nightstand. They contain tidbits, comments, funny quotes, descriptions of dreams, and crazy ideas that date back to fall 2005. One notebook contains a bunch of torn out pages from other notebooks... all of those beginnings, all of those ideas I loved enough to tear out and keep so I could do something else with the journal. So this morning, as I'm unpacking I was just randomly unfolding pages and reading some things I had written while living in that little converted garage. Notes I had made for myself about nice little things CSB did for me one morning before he left for work, or sweet things he has said over the years, things I had felt about him or feelings I was having about where our relationship might be going, but was too scared to voice. One little entry particularly caught my eye.... a comment about how much I enjoy writing, yet not everything is fit for the internet, and although I enjoy writing a blog it is so important for me to keep writing in these little journals and putting my thoughts on paper. At that point I realized that my form of nostalgia is in words. I have notes I've written myself and random journal entries that I've written since childhood (I started keeping a diary at about 6 years old, and still have multiple books that I regularly wrote in during my childhood). I know I don't have everything I've ever written, but I have enough bits and pieces to put together a lifetime of memories. It may not be a story worth publishing, but someday I will take all those bits and pieces and put them in order and leave them for future generations who might be interested. I found my nostalgia in the form of words. Reading the things I had written, even looking at how my handwriting changed based on emotion, situation, or how tired I was (some things were actually noted as *written in the middle of the night- half asleep* or *on the beach-it is windy-next time bring a paperclip*) took me straight back to a memory... or not. There were many odd little notations or quotes where I have no idea what I was thinking when I wrote them or even what they mean.... yet, there they were, dated and a part of my history, sitting in a notebook waiting for me to revisit. Words have been merely functional for me over the last couple of years, as a teacher and as a student. Today I was reminded that words need to be more than just educational tools... words are the way to chronicle our lives, to leave tidbits of our personalities for our future generations,our future selves. Words remind us where we have come from, and how hard we have worked to be where we are. I have found my nostalgia in words and although they don't take up much physical space, they seem to encompass my entire world.